All Products: Demos, Catalog, Awards, etc. Discover why Total Access Analyzer is the most popular Microsoft Access add-in and the winner of EVERY Best Access Add-in award since 1994! "You have to have this program!" Total Access Analyzer helps you create Access databases with more control and fewer errors. Total Access Analyzer is the only program that analyzes all the objects in your database to determine how it works, and reveal links and potential problems. Unlike the built-in Access documenter that only looks at individual objects, Total Access Analyzer looks at all the objects. That's the only way to tell everywhere an object is used, objects and code that aren't used (e.g. queries, procedures, and variables you are afraid to delete), references to objects and fields that no longer exist, and many other potential problems. Catch errors before you distribute your Access database. Total Access Analyzer catches runtime errors such as references to missing objects or fields, corrupt objects, invalid table links, objects calling procedures with the wrong number of parameters, etc. Over 100 types of errors, suggestions, and performance tips are offered. Why let your users or clients crash on bug Total Access Analyzer can automatically detect? Taking over someone else's database or trying to understand your own database? Not sure how a database works? Total Access Analyzer gives you the detailed and summary information you need! Generate table/field listings, object cross-reference showing where each object is used, application flow diagrams, data flow diagrams, object diagrams, formatted bracketed module code printouts, and much more. Get rid of unused objects and code. Do you have queries or code you're afraid to delete because you're not sure if they are used? Let Total Access Analyzer find your unused tables, queries, macros, sub-macros, forms, reports, procedures, variables, constants, and user defined types. Cleanup your database to make it faster and easier to maintain. Make sure your fields are consistent across all your tables. Are you sure the same field has the same type across all your tables? Is the same numeric field sometimes an integer, long integer, and/or double? Are your text fields the same length? Total Access Analyzer catches these inconsistencies so you can quickly resolve them. Enhance performance and make your application more robust by finding modules without Option Explicit, procedures without error handling, procedures that should be private, variable scope conflicts, unnecessary debugging code, type cast omissions, etc. Creating archival documentation of your database is a critical part of professional system development. Total Access Analyzer includes over 225 professional quality reports covering all aspects of your database. For many consultants who charge their clients for technical documentation, Total Access Analyzer pays for itself many times over. Impress your clients and bosses with extensive documentation showing the work you've done! Versions are available for Microsoft Access 97, 2000, 2002, 2003, 2007, 2010, 2013, and 2016. Total Access Analyzer is licensed on a per user basis. Each user who runs the program must have a license. Read the License Agreement for details. Microsoft Access 2019 Version is shipping! 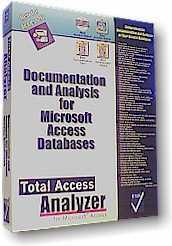 "Total Access Analyzer is an amazing product that I've relied on and recommended for years. It's a huge time saver."